The fact that people in the Aviation industry are so passionate about what they do, unlike many other types of jobs. That helicopter flight is the closest thing to a magic carpet ride. Ferrying a machine up the East coast from Sydney to the Whitsundays, spectacular coastline and stunning scenery as well as a fantastic learning experience shortly after receiving my commercial licence. Learning to a fly helicopter is extremely rewarding for both the student and the instructor and every day and every flight is different, no matter how many times you’ve done it before. 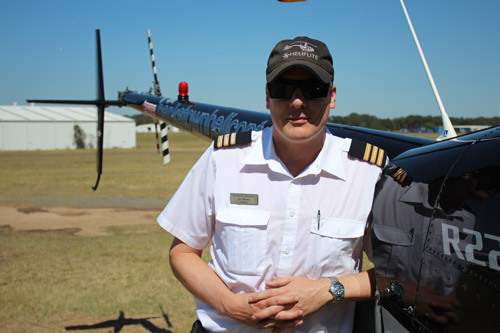 Job satisfaction comes from seeing first-hand the sense of achievement on a student’s face when he or she masters a challenging task early in the flying syllabus, like the first time they discover that they can hover the helicopter on their own, or when they return from their very first solo flight. I used to be a TV News Cameraman and spent a lot of time in helicopters filming. At the time I thought it would be a lot more fun flying the helicopter, which it is! One of the highlights for me is to now take camera operators up for aerial photography jobs, including for TV shows. I really love being able to share the thrill of helicopter flight with passengers who mostly have not flown in a helicopter before. I love the challenge, knowing we are responsible for the next generation of pilots. We get to meet so many different people from different walks of life and we need to adjust our instructional techniques to accommodate each person. I find it is the most rewarding thing I have ever done. Pilot of the B206 Jet Ranger featured in the TV series "Underbelly"
I enjoy showing people what I have a passion for - flying helicopters. The smile on peoples' faces when coming out of their first ever flying lesson and their astonishment when coming out of their first hovering lesson! I enjoy teaching and seeing the satisfaction on trainees faces when they achieve their goals.